I want to apologize for the lack of post on here this week. As it turns out when there is an ice storm 40 miles away your internet quits working for almost 3 days. On Tuesday Kentucky got hit with snow, ice, and rain...we only got rain. Do you know how long 3 days is in Internet time? Don't think about it too long or you'll go insane. So I could be over reacting quite a bit, but I did feel completely unconnected to the rest of the world. 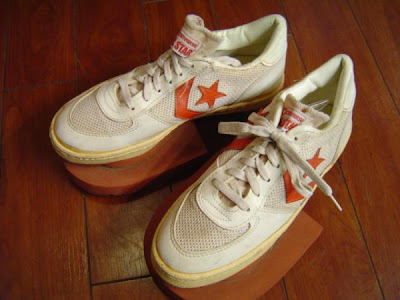 Anyway I am back with a great post for The Converse Blog's Friday Flashback. 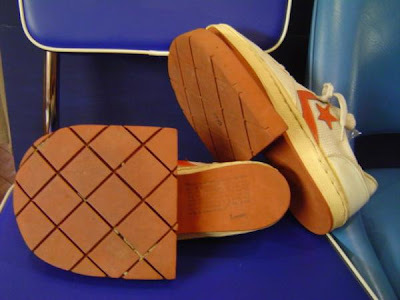 Did you know that Converse used to make everything, well not everything but close. Recently I've seen a Converse rubber rain jacket on eBay along with some fishing boots. We've all seen something similar to these in Eastbay, but I've only actually ever know one person to buy shoes like these. There really aren't many words to describe these shoes so just take a look. I am pretty sure that idea for shoes like this is to keep your legs flexed and increase muscles size. It is a similar idea to Chicken farms that tie their Chickens down so that stand on their tip toes all of the time to increase muscle size. The only differences are that you can take these shoes off and people won't eat your meaty legs from a bucket. I'll be talking about this more next week, but congrats to Jameer Nelson for being selected as an Eastern Conference All Star reserve. How big a deal is this? Well, Converse will have as many players in the All Star game as Jordan and Reebok, so I'd say it's a pretty big deal. Also if you get the chance check out the Marquette vs. Georgetown game tomorrow. All of the Marquette staff will be rocking the Converse Pro Leather 76 as part of the Coaches vs Cancer weekend. Also keep an eye out in the crowd as Converse will be hooking up the student section with some free t-shirts too! I had a pair of these in College. 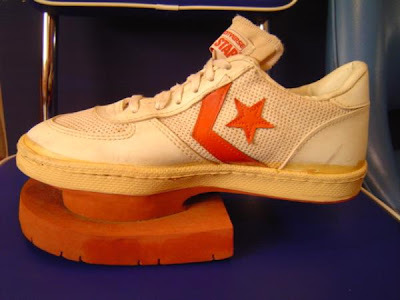 A coach in Jackson, MS gave me a pair to try out in 1983. They added 9 inches to my vertical jump in 2 months. They sell them as speed training shoes now days. They concept is that they stretch your achilles tendon. I still have my pair at home.